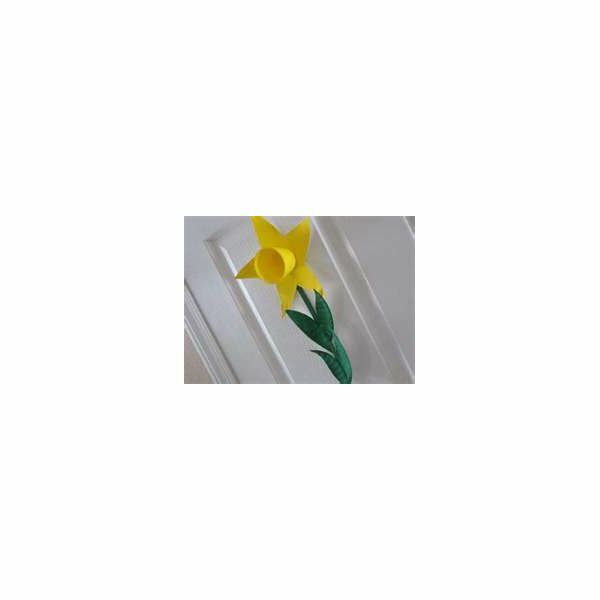 The following four free preschool daffodil craft ideas are practiced ideas which are presented for the use of any teacher searching for a springtime classroom theme to brighten the room and bring nature inside. Children love to explore their natural environments, and these crafts will assist children with that exploration while learning skills such as counting, cutting, gluing, planting, and teamwork. Take close-up pictures of the faces of the children, trying for smiling photos to create a sunnier daffodil. Ask the children to color various daffodil petals, using whichever colors they enjoy. After the picture is developed or printed, cut the child's face into the shape of a circle. Paste the child's daffodil petals to the back of the child's picture so the face is the center of the flower. A variation of this project includes using pipe cleaners to create a 3D look. After the children color the petals, attach pipe cleaners to the full length of the petal. Attach petals to pictures, then bend the pipe cleaners so the petals reach out from the child's face. Planting daffodils is a great classroom craft and activity for preschoolers. Simple planting can encourage teamwork, socialization, and children are allowed to get dirty. Obtain enough window boxes for the class to use in groups of three. If you have nine preschoolers, you will need three window boxes. Provide all childre with shovels and planting soil reinforced with plant food. Ask children to fill the window box with soil, then sprinkle the top with daffodil seeds. Follow the package intructions for proper planting and initial care. Allow the children to assist with the daily plant care. This project can also be done outside in proper climates. Create between eight and ten petals for each child with optional traceable numbers on each petal. Create centers for the petals, then ask children to color and trace or write numbers on each petal. Petals can be counted out loud for younger preschoolers. Allow the children to glue the petals to the flower centers. Give each student a small paper cup, then assist with painting the cups yellow. Use colored construction paper to draw daffodil petals, then ask children to cut out the shapes. Assist children with gluing petals to the yellow cup center with craft glue, then poke a hole in the bottom of the cup. Insert a green pipe cleaner through the hole, and attach the "stem" inside the cup with tape or craft glue. These free preschool daffodil craft ideas are for the use of any teacher searching for ways to bring daffodils into the springtime curriculum. Teachers who act as a community will work together to share ideas to help all preschool classrooms grow to full potential.